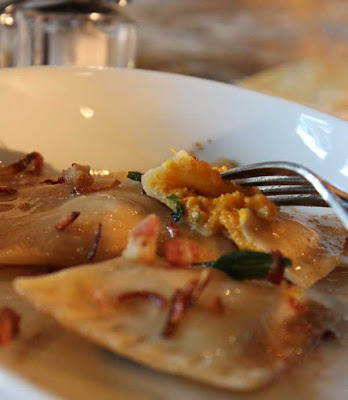 Pumpkin ravioli is not new, it's not earth shattering, but It's almost a requirement for the Fall season - and it's sooo good. The recipe I created below gets a helping of flavor from the fresh ginger. 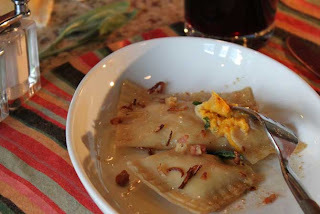 This is a hearty dish, so serve with something light (a simple salad) or make your ravioli small so as not to overwhelm. You can make these ahead of time and freeze them too. Tips and techniques: Browning butter can be a super tricky process, it's easy to burn the butter. But there is a simple method to follow. Make this the last thing you do before you serve the ravioli. Heat a sautee pan, add a pat of butter, do not touch the pan. Let the butter melt and sizzle on the edges for a minute, the edges will start to brown. Drop in a few sage leaves, pick up the pan and swirl the butter so that the rest of the butter pat melts. Return to the burner (medium to low heat) for a minute. Add in the ravioli and toss, or just drizzle over the ravioli on a platter. Roast the pumpkin by carefully chopping in half. Drizzle with a little olive oil and rub with 1-2 tbls of brown sugar. Place cut side down on a baking sheet. Bake until pumpkin flesh is fork tender. Scoop out the pumpkin flesh into a large mixing bowl. Using a whisk, smash the pumpkin until smooth and whisk in the mascarpone, nutmeg, ginger, cinnamon, egg, chopped thyme, sage cheese and salt and pepper. Scoop the pumpkin filling in to fresh pasta dough sheets (or wonton wrappers if you don't want to make the dough.) See my posting on fresh pasta for recipes and ravioli instructions. Warm a sautee pan, add 2 tbls butter. Let the butter melt until it begins to brown on the edges (do not touch the pan). Add in 4-5 fresh sage leaves. Pick up the pan and swirl the butter, replace over heat for 1 minute. Toss with the ravioli. Cook the pancetta until crispy, remove from pan and add in the shallots. Fry the shallots until crispy. Set aside. Cook the ravioli. 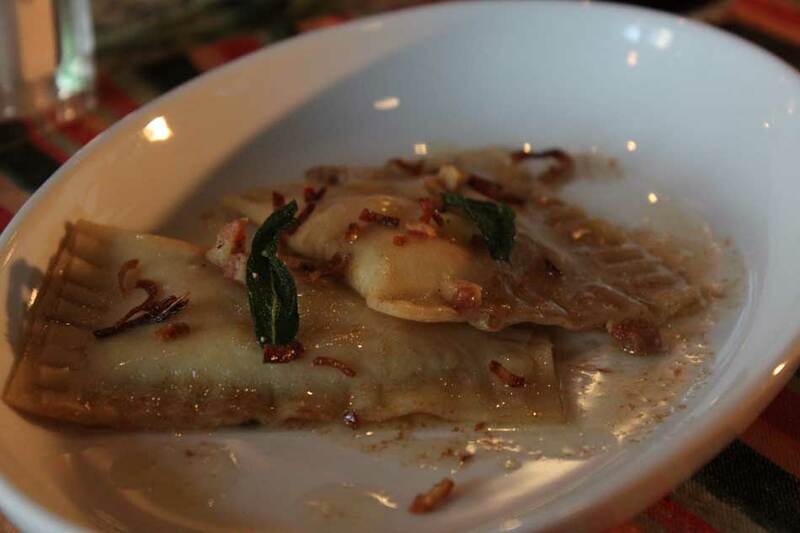 Serve the ravioli with the brown butter sage sauce, topped with fried shallots, crispy pancetta (optional), fried sage and shredded goats milk cheese.